Honey is a rich source of many essential nutrients and has been used for centuries to cure many skin problems including red inflamed acne, skin scars, skin burns, rashes and skin swelling. Honey is a good source of Vitamin B1, Vitamin B2, Vitamin B3, Vitamin B6, Vitamin C and Zinc. All of these nutrients are important for new and healthy skin cells, fight against skin damaging free radicals, slow down aging process and deeply moisturize skin. Topical application of honey helps a lot to improve your overall complex and evens out your complexion. Several beauty benefits of Honey makes it an essential component of chemically prepared expensive commercial beauty products including various skin masks, packs and lotions. 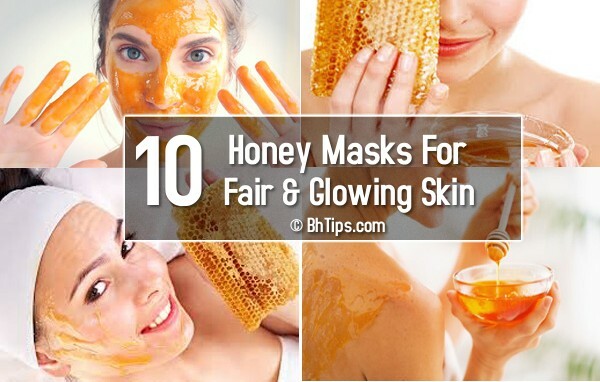 However, here we have a collection of best homemade Honey masks and packs for fair, glowing and even skin tone. Honey along with Lemon juice is highly beneficial in to get fair and glowing skin. Lemon is a rich source of vitamin C. Great for skin lightening and removing acne scars and dark spots. It not only helps in bringing natural fairness but also gives you an even skin tone.You can prepare a fair glowing honey mask according to given instruction. Take 1 tablespoon of honey and mix with 1 tablespoon of lemon juice. And apply this mixture to your clean face and neck. Wash off after 15 minute and pat dry your skin. Honey along with milk powder, lemon juice and almond oil is very helpful to get rid of tanning due to sun exposure. Mix equal quantities of honey, milk powder, lemon juice and almond oil. Apply it on your face, neck, hands, etc. Keep it at least for 20 minutes and then wash it off with fresh water. Papaya helps in skin whitening with the help of an enzyme called papain. You can make papaya mask along with honey for fair skin by following given instruction. Mix some papaya pulp with honey to make a skin whitening mask. Apply this mask on your face and neck. Wash your face after 20 minutes. Apply this mask at least thrice a week to get fair and glowing skin. A fine mixture of honey and Fuller's earth is also very helpful to to get fair and glowing skin.This face mask not only remove excess oil but also helps to give fair glowing skin and healthy skin. Take 1 teaspoon of honey, 1 teaspoon of fuller's earth(multani mitti) and 1 egg yolk. Mix all the ingredients and apply this mixture to your face at least for 15 minutes. Finally wash off with lukewarm water. Deep skin cleansing properties of Yogurt along with skin bleaching properties of honey are also very helpful to get fair and glowing skin. Mix one tablespoon of raw honey with 2 tablespoons of plain yogurt. Apply to face and let it stay for 15-20 minutes. Use a warm washcloth to wipe off. Finally splash with cold water to close skin pores. Honey is loaded with antioxidants, enzymes, and other nutrients that nourish, cleanse, and hydrate skin. Avocado is a rich source of A, E and C . These vitamins not only helps to whiten your skin tone but also helps slow down signs of aging. Mix one tablespoon of raw honey with 1/2 ripe avocado. Apply to face and let sit for 15-20 minutes. Use a warm washcloth to wipe off and wash you face with cool water. Skin exfoliation at least once per week is essential to remove dirt, dust, impurities and dead skin cells. This promote the growth of new and healthy skin cells. Baking soda, is a gentle natural exfoliator that removes dead skin cells, allowing new cells to emerge for a radiant and glowing complexion. Baking soda offers light exfoliation while the honey soothes and smooths the skin as well as deeply moisturize. Make a gentle scrub made with two parts honey and one part Baking Soda. This scrub can be used to exfoliate your face as well as arms, legs and feet. Gently scrub your skin for 3-4 minutes. wash off after 10 minutes. Honey and Sugar mixture can be used to exfoliate skin as well. You can make another amazing scrub by following given instructions. Mix a small amount of honey with an equal part organic raw sugar and few drops of lemon juice. Rub this mixture gently over wet face and neck in a circular motion for 2-3 minutes. Finally rinse off with lukewarm water. Mix one tablespoon of raw honey and mix with 1 tablespoon of uncooked and finally ground oatmeal. Apply to face and neck and let sit for 15-20 minutes. Finally wash off with fresh water and apply a good moisturizer. A gentle scrub made from orange peel, honey and oatmeal not only helps to brighten up your complexion but also helps in getting rid of acne and pimples. Raw honey contains antibacterial properties that remove germs that cause acne from deep within the skin pores. Orange peel is a great source of vitamin C, and excellent for lightening dark spots and acne scars. Evens out skin discolorations. Oats not only gently exfoliate, remove dead skin cells and promotes soft and smooth skin. Oats also nourishes skin of all types and absorbs excess sebum from within your pores as it is an absorbent. According to given instructions you can make the whitening mask at home. Take 1 teaspoon honey, 1 teaspoon orange peel powder and 1 teaspoons of ground oats. Mix all the ingredients and apply on your face and neck by using your clean fingers. Finally rinse your face and pat dry with a clean towel.